Get power-user features in the style you need—a 19” rackmount. The CopyWriter Pro Rackmount offers a 500 GB hard disk to store disc images and extract audio tracks. Adjustable record speeds, verification mode, and the ability to record to CD-R(W), DVD-R(W), DVD+R(W), and DVD-DL allow you to handle virtually any record project. See the Comparison tab below to compare the features of this duplicator against Microboards' other duplicators. 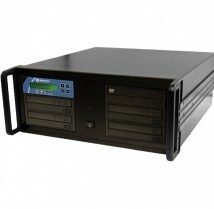 Burn CD-Rs or DVD-Rs four at a time with the CopyWritter Pro rackmount duplicator. Burn at 48X CD-R and 24X DVD-R, and use CD-RW, DVD-RW, DVD+R, DVD+RW, and even DVD-DL media with the Microboards CopyWriter Pro duplicator. A built-in 500GB hard disk drive allows the storage of multiple master disc images. Or extract audio tracks and mix your own discs. The intuitive 5-button panel and multi-line display make copying discs easy for the novice user, while maintaining power user features like disc verification mode and adjustable recording speeds. Features don’t mean anything without reliability, which the rackmount duplicator is bursting with! Quality components and careful assembly, backed by industry leading service, ensure you’ll be burning discs trouble-free for years to come.